Summer calls for sunny days and flavorful nights, so instead of an expensive night out, why not host some outdoor backyard fun for your kids and their friends, take your movie night outdoors, stake out at tent in the backyard, lay out your sleeping bags, and make some flavorful snacks. 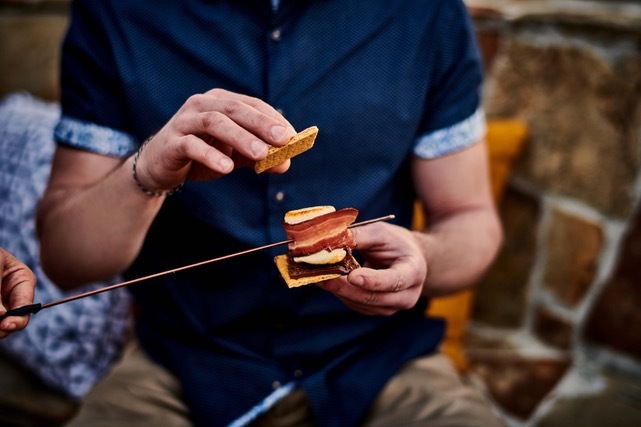 Take you traditional S’mores to the next level by making Bacon S’mores with Smithfield bacon – wrap your toasted marshmallow with bacon and squish it in between melted chocolate and graham crackers. It’s easy to make and a sweet and flavorful treat that will surely delight your backyard campers on those balmy summer nights. 1. Preheat oven to 375°F. Separate strips of bacon & lay out flat in single layer on lightly sprayed, foil-lined rimmed baking pan, gently stretching each strip by an inch or two. Bake for 10-12 minutes or until bacon begins to curl & edges just starting to crisp, rotating pan halfway through cooking. Remove bacon from pans with spatula while warm, draining briefly on absorbent paper & reserve. 2. Cut bacon slices in half crosswise & tightly wrap around marshmallows, securing with skewer or roasting stick. Roast marshmallows over campfire until toasty brown on the edges, being careful to not burn or ignite your marshmallows! 3. Immediately sandwich roasted marshmallows between two graham crackers with a piece of chocolate & eat hot from the fire! Never fear if a campfire is not near! Try roasting over your outdoor grill to make things quick and easy! 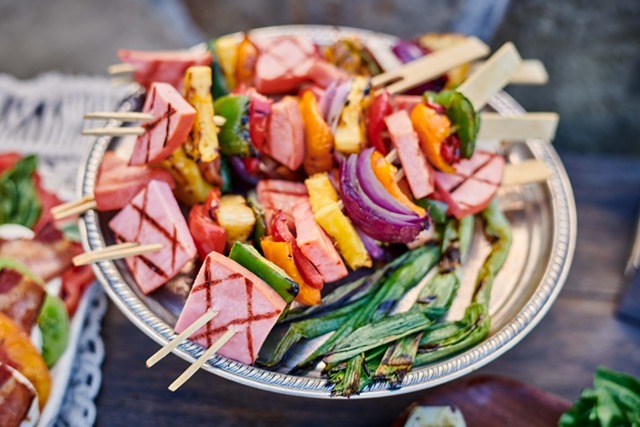 And if you are looking for a fun way to compliment your outdoor family fun, try lighting up the grill and serving some Hawaiian Ham Skewers combing the smokiness of Smithfield anytime favorite cubed Ham with the sweetness of fresh pineapples. 1. In small bowl, prepare glaze by whisking ingredients together until combined & reserve, refrigerated, for up to three days in advance. 3. Skewer ham and vegetables by alternating ingredients & brush with about 1/3 of glaze. Grill for 8-12 minutes or until slightly charred & vegetables are cooked as desired, turning as needed. Glaze skewers about halfway through cooking & once again before serving. Garnish with thinly sliced green onion. Ever try tamari? Tamari is a wheat-free (for those avoiding gluten) variation of soy sauce with a less salty, smoother taste.